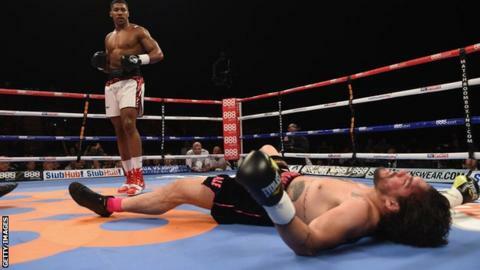 Britain's Anthony Joshua made it 12 knockouts from 12 fights by beating Raphael Zumbano Love in Birmingham. Olympic champion Joshua, 25, floored the Brazilian, 34, in front of American heavyweight Kevin Johnson, whom he will fight on 30 May in London. Love failed to beat referee Phil Edwards' count when knocked down one minute and 21 seconds into round two. "I'm feeling more confident with every fight and looking forward to fighting this man," said Watford-born Joshua. Johnson, 35, said he expects an "easy" fight when he faces Joshua at the O2. Joshua, in his 12th professional bout, made light work of Love, who had been stopped only three times before Saturday, at Birmingham's Barclaycard Arena. Fellow Olympic gold medallist Luke Campbell continued his apprenticeship at lightweight with a third-round stoppage win over Frenchman Aboubeker Bechelaghem. There were also wins for former amateur stars Callum Smith and brothers Kal and Gamal Yafai, as well as former middleweight world title challenger Matthew Macklin.